Driving the Mars Exploration Rovers (MER) mission further into its fourteenth year of surface operations, Opportunity continued hiking the slopes of Cape Tribulation in February and finally reached the crest of Endeavour Crater’s western rim. There, the robot field geologist looked around with her Panoramic Camera ‘eyes,’ took dozens of pictures of her view, and was about to hit the road – until the scientists saw something too intriguing to pass up in the images the rover was sending home. But in the images the MER scientists saw an outcrop of finely striated bedrock that looks like it had been etched or carved by something. So they decided to have Opportunity also conduct one last scientific campaign before departing. “We were about to exit the ‘door,’ but suddenly we discovered this ‘door’ is pretty exciting,” said MER Project Manager John Callas, of the Jet Propulsion Laboratory (JPL), the birthplace of all NASA’s Mars rovers. The outcrop is more of the same breccia bedrock that formed during the impact that created the 22-kilometer (about 13.7-mile) diameter Endeavour, which the team calls Shoemaker Formation. Opportunity has been roving on and around this breccia since pulling up to the crater’s western rim in August 2011. “But we realized it would be our last full science campaign in Cape Tribulation and of Shoemaker breccia, maybe forever,” said Arvidson. More than that, this sample of Shoemaker is so visually distinctive the scientists were compelled to command the rover to take a closer look. “We decided to take some detailed Pancam imaging of the area and are still debating whether the geomorphic expressions, the striations were formed by wind or ice or something else that occurred during the impact,” said MER Deputy Project Scientist Abby Fraeman, who first worked on the mission in 2004 while still a high school student and one of The Planetary Society’s Red Rover Student Astronauts. After Opportunity completes her final science campaign, the plan is for the rover to exit Cape Tribulation and drive as quickly as possible to the mission’s next major science attraction, a gully, about 710 meters (0.44 mile) down the road, a place just named Perseverance Valley, where the mission will make more history with the Martian history it uncovers. Extending down the big crater’s western rim at Cape Byron for approximately 200 meters (about 656.17 feet), the gully is just a few tens of meters wide and in orbital images looks to have been carved by water, in part because of seemingly telltale channels that branch from it. A small nearby crater superimposed on the rim indicates the gully is a very old geological feature, one that, like Endeavour, most likely dates to the Noachian Period 3-4 billion years ago when Mars was more like Earth, and featured lakes and rivers, and perhaps even an ocean. Opportunity’s next major science attraction is a gully, clearly visible, just left of center in this image taken by the HiRISE Camera onboard the Mars Reconnaissance Orbiter (MRO). This view was processed in false color and then stretched (2X VE) so the MER scientists can better see the feature and the channels that appear to emanate from it. On average, the gully’s slope is fairly shallow, about 15 degrees, a slope that should be easy for Opportunity to navigate, especially with her experience negotiating steeper slopes in Marathon Valley and Cape Tribulation. “It’s just a matter of getting there,” said MER Principal Investigator Steve Squyres, of Cornell University. Once Opportunity crosses over Endeavour's rim at Cape Tribulation, she will head caddy corner down the outboard side of the crater to the southern part of Cape Tribulation and then onto the flatter Meridiani plains that lie in between the capes. That terrain will enable the rover to fast track her trek. “We’ll take an express route to get to the head of the gully on Cape Byron,” said Arvidson. JPL Rover Planner Paolo Bellutta, who years ago developed a novel method to assess rover traversability on the Martian surface, used his algorithm to compute MER’s 10th extended mission route and the “express route” to the gully. He has computed Opportunity’s routes since 2012 when the rover began exploring Cape York, the first segment of Endeavour Crater’s western rim that the MER mission checked out. With the aid and input of what he calls “difficulty maps,” which he creates from images taken by the HiRISE camera onboard the Mars Reconnaissance Orbiter (MRO), Bellutta’s software takes into account the Martian season, the rover’s tilt, the slopes and types of terrain, as well as visible or known geological obstacles, and then automatically computes the safest efficient route. The program also automatically computes alternate routes or “Plan B’s,” as Bellutta calls them. That’s just in case the rover encounters obstacles the software could not or did not account for in the initial computed route. In fact, Opportunity took a Plan B route in January when she couldn’t make it up slippery, soil-covered bedrock on steep slopes she encountered in Cape Tribulation. When the rover gets to the Meridiani plains, she will follow the express route and in effect make a beeline for Cape Byron. 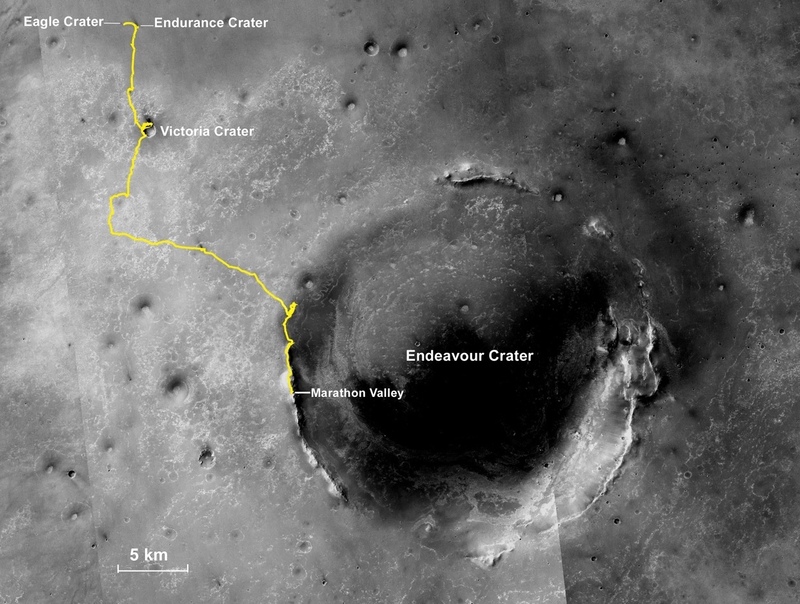 Opportunity will then re-enter Endeavour’s western rim at the top of the gully and at long last begin the highly anticipated, first-ever close-up surface study of an ancient gully on Mars. So far, all systems and circumstances are “go.” The Martian summer has been a good one for Opportunity. The rover worked under “storm free skies” throughout the month of February, according to the Mars Weather Reports, which use orbital data from the Mars Color Imager (MARCI) onboard MRO, and are produced by Malin Space Science Systems (MSSS). But “a large regional dust storm,” as Callas described it, did whip up a significant amount of dust into the atmosphere some 500 hundred kilometers away and darkened the skies over Endeavour, and that did impact the rover’s power. Dust from a large regional storm a few hundred kilometers away moved in on Opportunity toward the end of February 2017. The rover was working on a panorama at the crest of Endeavour Crater’s western rim, near her exit from Cape Tribulation. Martian dust storms can be life threatening for solar-powered rovers. No rover knows that better than Opportunity. After all, she nearly lost her life in the planet-circling storm of 2007. This time around however, something scientifically fortuitous happened. As Opportunity was wrapping her final science campaign in Cape Tribulation, the storm appeared to be moving away. "But the latest Pancam images show dust moving in the north, about 200 kilometers away," said Bellutta. As Mars giveth, it also taketh away. On at least two occasions in February, wind gusts cleared some of the accumulated dust on the robot’s solar arrays, giving Opportunity a nice little boost in power. Under the hazy skies typical of Martian springs and summers, the rover began the month producing a respectable 466 watt-hours, which is less than half her capability after landing in 2004 with sparkling clean solar arrays. By month’s end, she was producing 559 watt-hours of power, nearly two-thirds her full capability, and was utilizing more of the sunlight hitting her solar arrays than at the beginning of the month even though the sky overhead was even hazier. What goes up however must come down. “We have to be careful,” said Callas. “I use the analogy that it’s like cleaning your house with a leaf blower, where you blow all the dust into the air and eventually it comes settling back down on you.” But for now, the newfound energy is something no one is complaining about. Meanwhile, on Earth, Opportunity roved back into the spotlight for another 15 minutes of fame at the 33rd Mars Exploration Program Analysis Group (MEPAG) meeting that convened on February 22-23, in Monrovia, CA. Chartered by NASA Headquarters, these regularly scheduled two-day gatherings assist the space agency in planning scientific explorations of the Red Planet and offer the Mars community a chance to catch up on current missions and ongoing efforts underway for future missions. During that meeting, Fraeman presented a jam-packed MER summary that primarily focused on Opportunity’s recent results at Endeavour Crater and the major science attractions down the road. All in all, the last year and a half of work in Marathon Valley and in the Cape Tribulation part of Endeavour’s western rim has been a textbook informing success. “Opportunity's recent observations continue to increase our understanding about the range and diversity of aqueous environments in Mars' history from the Noachian Period through the Hesperian Period,” she summed up. Opportunity captured this view of Endeavour Crater’s rim as she hiked up the slopes of Cape Tribulation in February 2017. Stuart Atkinson, an author, astronomy outreach educator, and MER poet, processed it from raw images that the rover took with her Panoramic Camera (Pancam). During the first two weeks of February, it was all about roving for Opportunity. On February 1st, not too long after the Sun rose on Endeavour Crater, the robot woke up on her Sol 4631 and got moving. She climbed 26 meters (85.03 feet) heading southwest toward her exit at the crest of Endeavour Crater’s rim and then, like always, took the routine images with her Pancam and Navigation Camera (Navcam) after the drive. Opportunity finished off the first week of the month with a 13-meter (42.65-foot) drive on Sol 4636 (February 7, 2017). Along the way, the ‘bot established a new Mars rover distance record when her odometer clicked past 44 kilometers (27.34 miles), a record the rover drivers had been looking forward to achieving. The gold line on this image shows Opportunity's route from the Eagle Crater landing site to Marathon Valley, not too far from her current location in Cape Tribulation. The MER mission has been exploring the western rim of Endeavour Crater since August 2011.The base image for the map is a mosaic of images taken by the Context Camera onboard the MRO. Larry Crumpler, of the New Mexico Museum of Natural History and Science, provided the route add-on. Mars seemed to applaud with a gust of wind that cleared some of the accumulated dust from Opportunity’s solar arrays as the first week of the month gave way to the second. The fresh dusting translated to an energy boost of an estimated 70 watt-hours. In addition to taking the usual images of her surroundings at this pit stop, the robot also checked out “a relatively small patch of outcrop,” as Guinness described it. In keeping the current naming theme, the team christened it Rulo, after the Nebraska site that the Corps of Discovery visited in July 1804, just a couple months into the first American expedition to cross what is now the western portion of the United States. It was a quick study that entailed the standard MER science protocol, taking the needed close-up pictures with her Microscopic Imager (MI) for a mosaic of the surface, followed by placement of her Alpha Particle X-ray Spectrometer (APXS) to glean the outcrop’s chemical composition. Opportunity completed the last of the in-situ or contact measurements on Rulo on Sol 4638 (February 9, 2017), and then continued her hike upslope. The exit from Cape Tribulation had proved to be challenging, but Opportunity continued to show her MER mettle throughout February as she followed the “Plan B” route Bellutta computed. On Sol 4640 (February 11, 2017), the rover put 28 more meters (91.86 feet) in the rear view mirror and pulled up to the top of Willamette Valley and the crest of Endeavour’s rim. “Realizing the rover would soon be leaving Cape Tribulation forever, we stopped and just started acquiring the panorama,” said Arvidson. 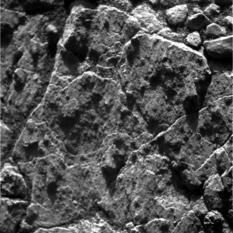 When the images began arriving at JPL, the team saw a vista filled with views the likes of which neither they nor Opportunity had seen in months of hiking the slopes – and they also zeroed in on the striated or etched bedrock. 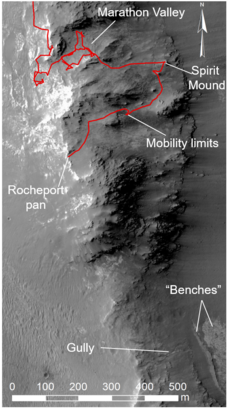 This image, taken by the HiRISE Camera onboard MRO shows the path Opportunity took through the slopes of Cape Tribulation along Endeavour Crater’s western rim. MER Deputy Project Scientist Abigail Fraeman added the route and location names, and labeled the rover’s next major science attractions to the south. 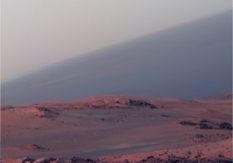 For the rest of the month, Opportunity spent quality time taking the images needed for the mission’s "parting shot" panorama. The MER team quickly named it Rocheport, after a town along the Missouri River that Lewis and Clark and crew passed through on June 7, 1804. On Earth, Rocheport features “a vertical cliff formed of limestone bluffs that is highly fractured,” said Arvidson. “It was full of rattlesnakes when Lewis and Clark visited and so they killed three snakes and then left.” The Corps of Discovery would pass through Rocheport one more time however, retracing their steps and visiting again on September 19, 1806 on the return trip from the Pacific Ocean. Despite its distinctive look, the striated bedrock, which exhibits “extensive scours,” is “Shoemaker breccia for sure,” said Arvidson. Even so, the scientists were bent on checking it out. “This is such an interesting site in terms of these carvings, these striations, that we felt we better document it. And since we’re there doing the Rocheport Panorama, it made sense to also do some IDD work,” he explained. 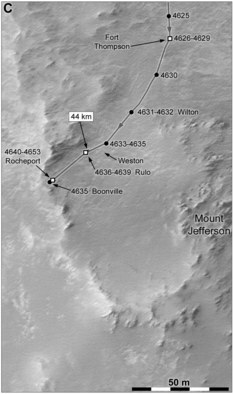 Since Opportunity would soon be saying ‘adios’ to Cape Tribulation, the segment of Endeavour’s western rim that she had roved down, around, and through for more than two years, the scientists also realized this would be the last chance for a final science campaign in this neck of the Martian woods. So, during the second half of February, in addition to taking the dozens of images needed for both Navcam and color Pancam panoramas, Opportunity worked on the investigations of striated bedrock and small rocks. Using her APXS and MI to conduct the regular MER scientific research, the robot field geologist, for example, checked out a 2-centimeter (0.78-inch) dark pebble, the team named Boonville, after an area of wooded bluffs overlooking the Missouri River, through which Lewis and Clark passed. 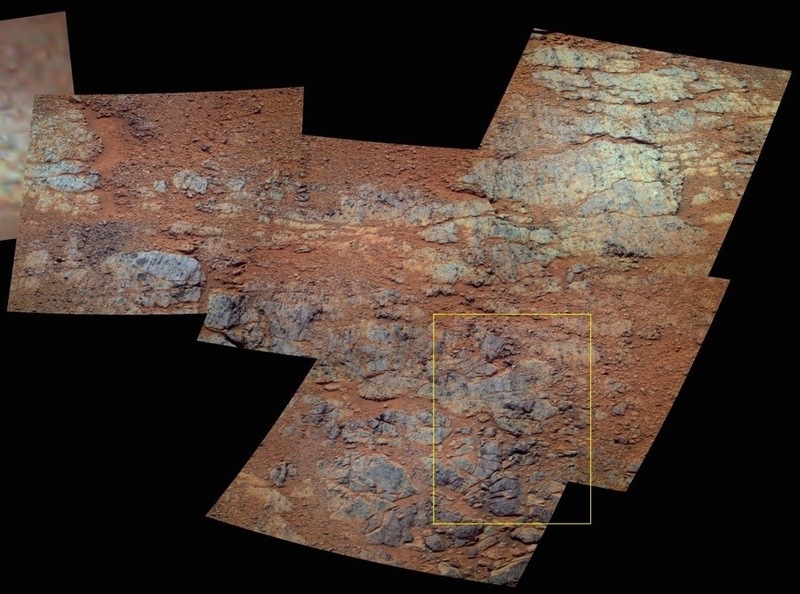 On Mars, Opportunity not only said “hello” to Boonville, she examined it and it’s surroundings, taking offset measurements in order to determine how the dark pebble differed, or not, from the geological stuff beside it. Opportunity captured this view of the crest of Endeavour’s rim, intriguing etched bedrock, and the horizon beyond as she climbed up the slopes of Cape Tribulation toward her exit in February. Stuart Atkinson processed this striking black and white image from the raw images the rover downlinked to Earth. Then, during the final weekend in February, Opportunity bumped 1.29 meters (4.23 feet) on Sol 4654 (February 25, 2017) to reach another part of the striated bedrock, where a clast or small rock fragment was embedded within the breccia matrix, said Arvidson. That bump brought the rover’s odometer to 44,033.87 meters (44.03 kilometers, 27.361 miles) and would be her final drive of the month. Following the bump, the robot then did an IDD salute, raising her arm out of the way so she could image the ground before her. “We looked at the small, 2-centimeter black clast and the surrounding matrix in this part of the bedrock,” said Arvidson. The team christened this final Cape Tribulation science target Waverly, after a site across the Missouri River from where Lewis and Clark camped in June 1804, and which is now a town. While the robot field geologist was beginning work on Waverly, a regional dust storm several hundred kilometers away had successfully lofted a significant amount of dust into the atmosphere that darkened the skies over Endeavour Crater. The increased opaqueness of the atmosphere above, in turn, reduced the amount of sunlight Opportunity could utilize for power production. But, the robot lucked out, or Mars smiled down again, as a wind gust or two presumably generated by that storm, whisked off more dust from Opportunity’s solar arrays. With storm-related events like this, the rover’s increase in energy tends not to last long because the dust that the storm whipped up into the atmosphere eventually begins raining back down. Within a couple sols, the Tau quickly dropped to 1.04 or in other words improved,” said Nelson. “But the dust factor got worsened, dropping from around 0.92 on Sol 4654 to 0.84 on Sol 4655 (February 26, 1017). Opportunity used her Pancam to take the pictures that went into this image from her stop at Rocheport at the crest of Endeavour’s rim, near her exit from Cape Tribulation. 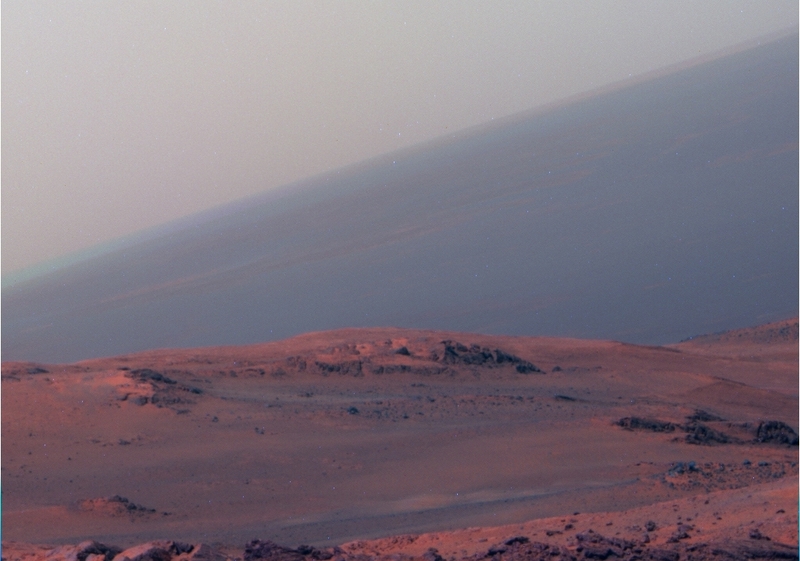 It is a small portion of the rover’s parting shot, the Rocheport Panorama. The yellow box is an area the scientists targeted for a full 13-filter Pancam observation. Meanwhile, on Earth, the MER scientists were debating how this distinctive striated bedrock might have formed. JPL’s Tim Parker, a MER Science Team member, is theorizing that the striations were formed by ice. Arvidson opined that “the preponderance of evidence is for wind erosion.” Another possibility is that it was scoured by a spillover. And the debate continues. At month’s end, Opportunity was ready already to rove over crest and hit the Meridiani ‘highway.’ If all goes as planned, the robot field geologist will be making her departure as the MER team members gather at Caltech for the annual MER meeting on March 1st and 2nd. The team will be initiating a new naming theme, said Arvidson. But what that theme was not yet determined at post time. 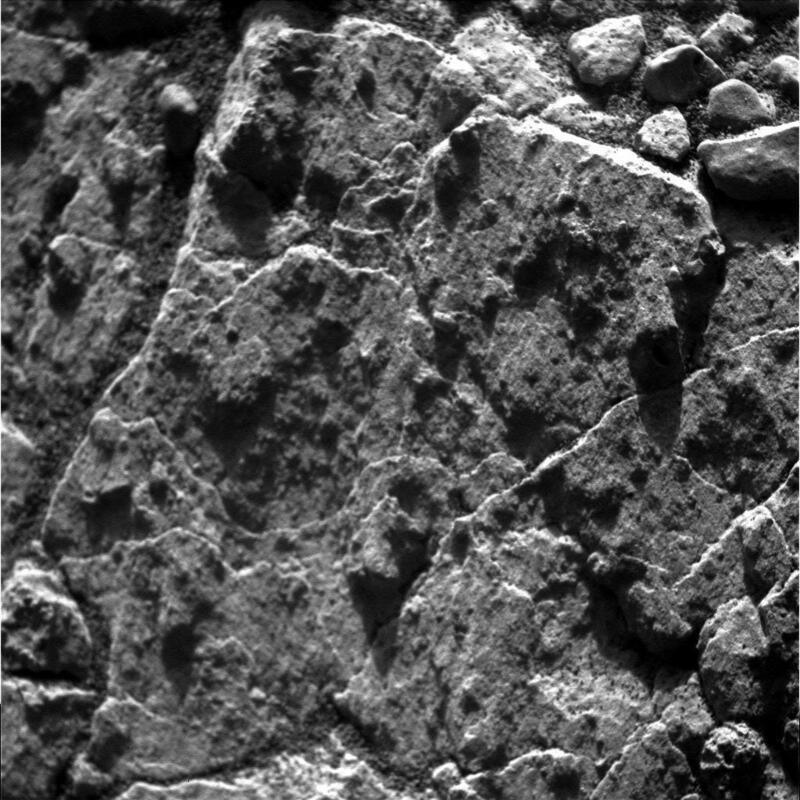 Opportunity used her Microscopic Imager (MI) to take this close-up of a dark clast or small rock at Rocheport. The MER team christened it Boonville, an area visited by Lewis and Clark in 1804 during the Corps of Discovery Expedition, now a town in Missouri named for the sons of legendary American frontiersman Daniel Boone. Later in March, several MER science team members will launch their veteran robot field geologist back into the spotlight at the 48th Lunar and Planetary Science Conference (LPSC) to be held at The Woodlands, Texas. When Opportunity does pull up to Perseverance Valley, the mission will transition from a rock mission to a mission focused on the geomorphology and sedimentology of the site. 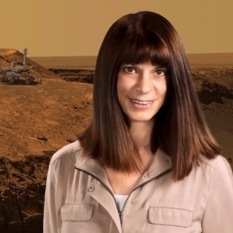 “What we really want to do with Opportunity is use mainly Pancam stereo imaging to acquire some detailed, textural images, and also to look for compositional information that can give us some evidence for how this feature may have formed,” Fraeman said at the MEPAG meeting. The MER scientists will be testing three hypotheses. Was the gully carved into the rim by a fluvial feature with a relatively low sediment load, such as a lake spillover or perhaps even a river? Was it formed by a wet debris flow that had a higher sediment load and was driven by rainfall or snowmelt? Or, unlikely as it seems, could it have been created by a dry avalanche? The favored hypotheses involve water and tantalizing hints for those theories appear in the orbital imagery. 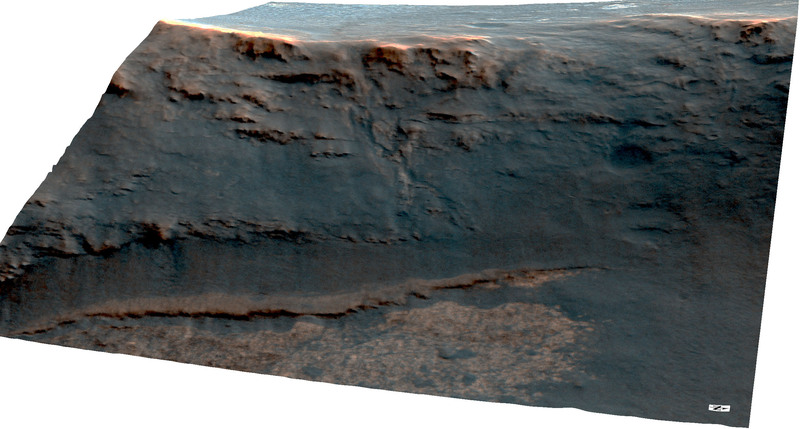 “In the HiRISE images, we can almost see these anastomosing channels a few meters wide that arise from this break in the slope,” Fraeman noted. On Earth, anastomosing channels are multi-threaded links or branches that radiate from and occur at lower gradients of streambeds and often feature thick clay and silt banks. If the scientists discover that the gully was formed by one of the two water hypotheses, they will then seek to uncover and characterize the source of the water. With the rover’s detailed imaging, the MER scientists will look for specific sedimentary structures like levees and bedforms that may point to one of these processes. They will also be scrutinizing characteristics of deposits they find, such as roundness, sorting, grading, and grain size of the sediments. One other important question they hope to answer is why this is the only gully feature they see on the rim of Endeavour Crater. Considering that the team’s research will represent the first-ever surface study of a gully on Mars, whatever the rover and the scientists discover will add a new chapter to the story of water on Mars. This graphic charts Opportunity's recent roves, from Sol 4625 (Jan. 26, 2017) to Sol 4657 (Feb. 28, 2017) and Rocheport, where the rover spent the last half of February. The annotated map is courtesy Phil Stooke, an associate professor at the University of Western Ontario, Canada, author of The International Atlas of Mars Exploration Vol. 2, Spirit to Curiosity: 2004 to 2014 (Cambridge University Press, 2016). The base image was taken by the HiRISE camera onboard MRO. Winter solstice in the southern hemisphere of Mars, where Opportunity’s site is located, occurs on November 20th of this year. In order for the rover and the MER scientists to have time to do some work before the freeze of the season slows the mission down, the rover really needs to be there several months in advance of that date. Time passes just as quickly on Mars as it does on Earth. So the push to get to the gully is really on now and there is a sense of some urgency among the team members. Beyond sand dunes and other obstacles that may slow Opportunity on her journey south, the rover will also have to hunker down incommunicado for two weeks in July for the solar conjunction. That’s when the orbits of Mars and Earth position the two planets on opposite sides of the Sun and disrupts communication. This regular celestial event occurs this year on July 26th, but for a two-week period around that date, communications between the rover and her mission ops team will be sketchy at best, completely blocked at worst, and are not advised. Typically, missions at Mars stand down and wait it out. In any case, Opportunity won’t be able to rove during the two-week blackout period of solar conjunction. Opportunity took the images that went into this unfinished view with her Navigation Camera (Navcam) in February after she reached the crest in the Cape Tribulation segment of Endeavour’s rim. It offers a glimpse of another stunning panorama to come. The achievements of Curiosity's team and hardware are little short of amazing and I love these monthly reviews. However, it gives a pain in the brain when I see "200 meters (about 656.17 feet)." My science teachers would have taken red ink to such silliness -- providing a distance to two decimal places implies a precision more than three orders of magnitude greater that actually measured. If we have to provide conversions from metric measures, it would be much more correct to have said, "200 meters (about 650 feet)." I accept my carping about this may be seen as picayune, but I assert there's a science lesson here, related to estimation and numeracy. I'd argue that the implied accuracy of the converted 0.01 feet (almost less than visible to the human eye) is a more wrong characterization of Curiosity's travel than my "650 feet" which is certainly off by something in the range of 10 feet! Precision and accuracy are not the same thing. Gavin your post is funny because the article is about MER Opportunity & not about MSL Curiosity. Ouch! I'm an idiot .. but a big fan of Curiosity AND Opportunity! Anyway, your approximation point is valid.